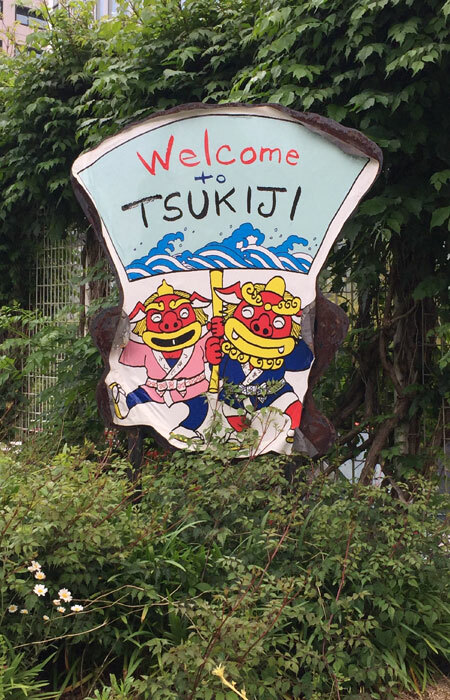 Tsukiji fish market is the largest wholesale seafood market in the world, so a visit can be overwhelming. The first time we went, my family and I ended up staying for only an hour. Once you see this sign, you know you’re in the right place. Many vendors display fish heads in front of their stands to show their products are fresh. 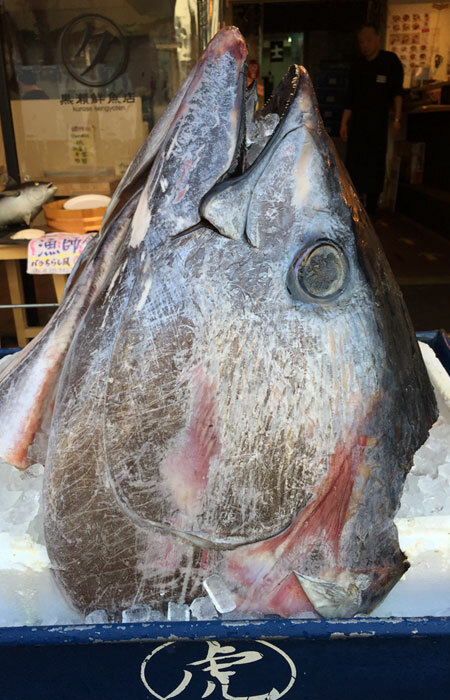 A recent family trip to Japan gave me the chance to experience Tsukiji again. This time we had a guide — a foodie guide who spent three glorious hours showing us delicious hotspots that locals go to. 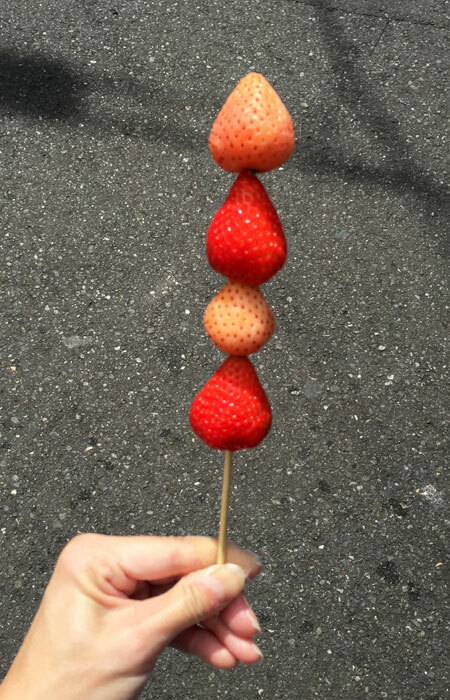 You’ll see strawberry-and-mochi combos around the market, but keep an eye out for the seasonal strawberries on skewers. They’re smaller and feature white and red strawberries. Look for the white strawberries — they’re unusually sweet. They’re around ¥800, but worth the price. 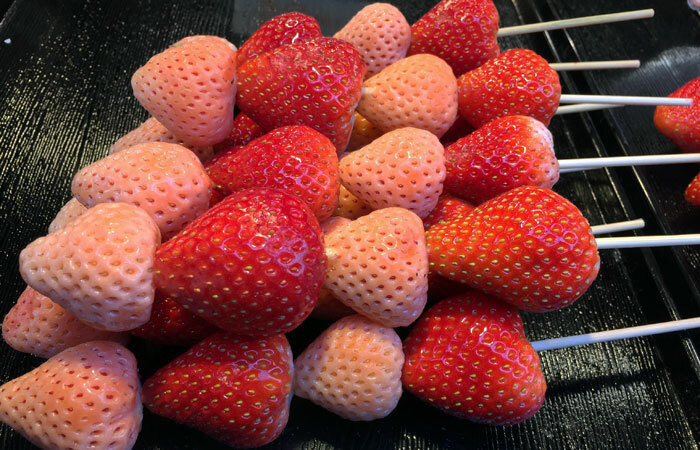 Some skewers feature only the white strawberries, while some sport a mix of strawberries, blueberries and grapes. If you love fruits, give these a try. The red strawberries are fresh, but the white ones are especially sweet. Plus, they’re easy to eat on the go. I’ve had uni before, but never quite like this. The portion size was extremely generous, and there’s just something so heady about eating it straight out of the spiny shell. Not only did the uni taste fresh, but it also glided off my tongue and down my throat. Talk about a melt-in-your-mouth quality. 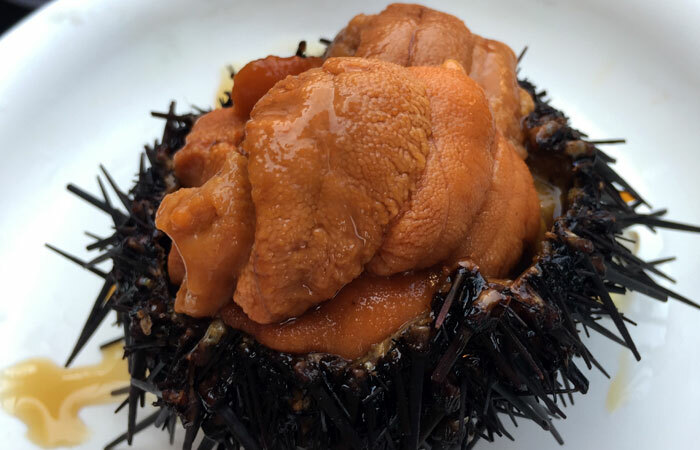 It’s not too hard to find vendors that sell uni at Tsukiji, but we chose this one because they were right next door. Our tour guide wasn’t planning on stopping here, but we made a detour because we love scallops. At first, I thought these scallops were just cooked on the grill. I was wrong. The vendor torched the scallops and uni before handing them to me on a plate. Talk about food and a show. 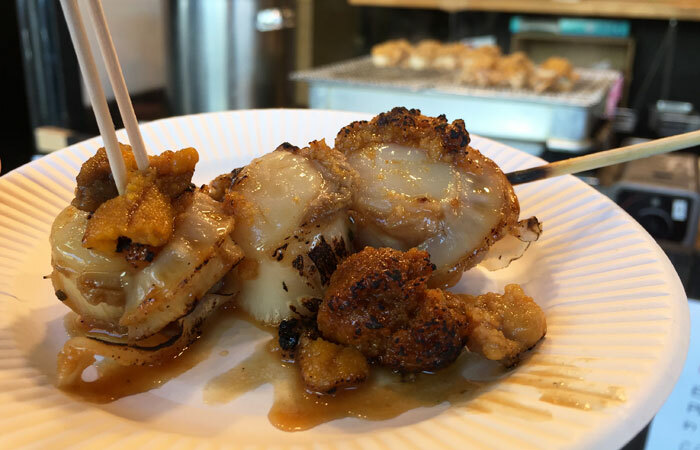 The scallops had the perfect consistency — chewy but not rubbery, and satisfyingly savory. 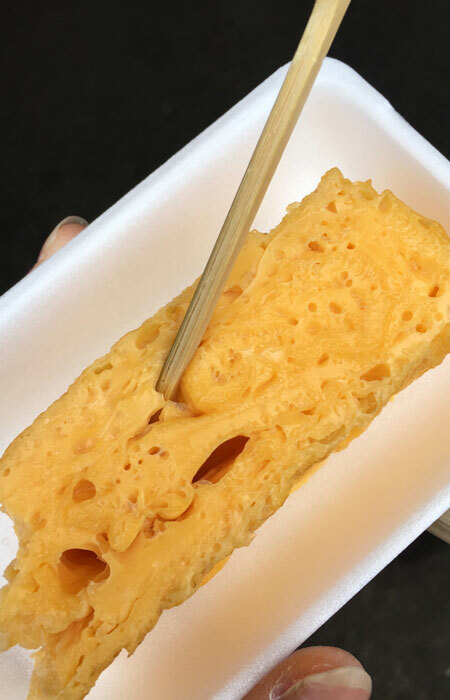 Even though we had just had fresh uni, I enjoyed the torched uni topping. It gave each piece extra umami. Talk about oishii! If we didn’t have more food to try, I probably would have bought a couple more of these skewers. 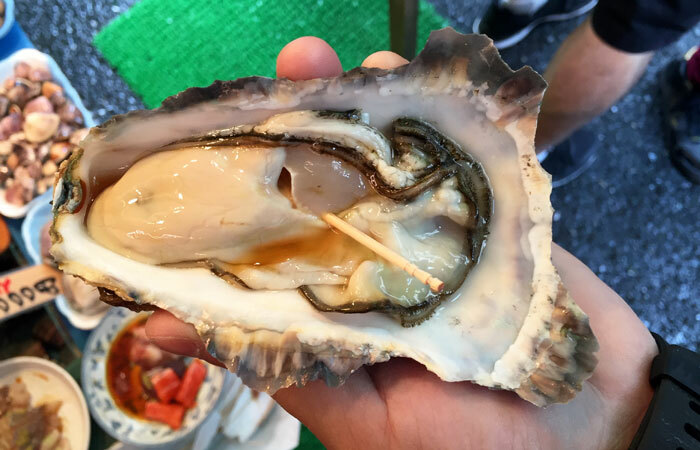 Tsukiji is home to some of the largest oysters I’ve seen in my life. Check out their size in proportion to our hands. It was rather difficult to inhale the oyster in one slurp. I had to break mine into two. Unlike other oysters I’ve had, it wasn’t overly briny or slimy, but the pronounced salty taste immediately reminded me of the ocean. Each slurp was almost euphoric. 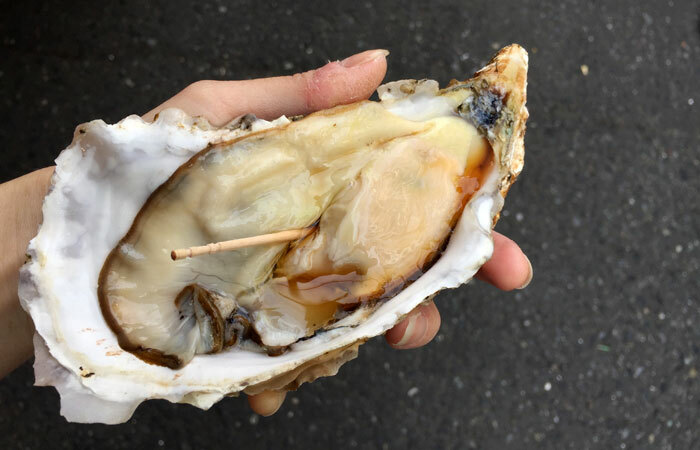 Now, Tsukiji oysters are my standard. When our tour guide said he was taking us to a kiosk that specialized in omelets, I was puzzled. What was the hype about? These omelets have an egg base and are light and cloud-like. No fillings — just egg, straight up. Think of the fluffiest scrambled eggs you’ve ever had, but in a rectangular, compact form. That’s the best way I can describe Japanese omelets. These eggs are folded, fluffy and don’t even need a lot of shoyu for flavor. I think about my typical breakfast omelet — stuffed with cheese, bacon and potatoes — and marvel at how simple and tasty the Japanese version is. When I saw “beans” on our food itinerary, I had to do a double-take. 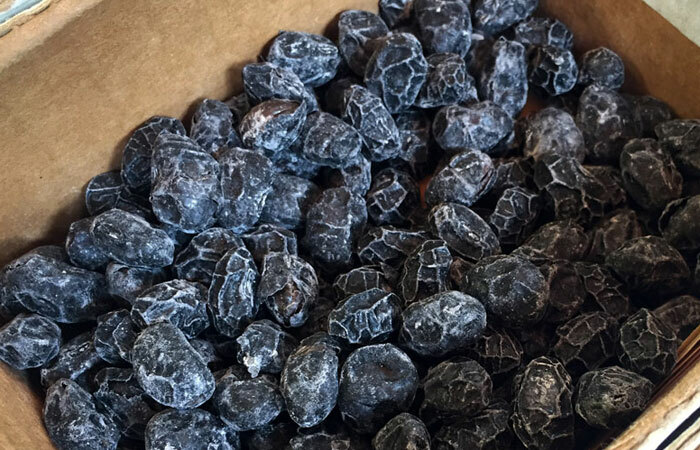 Our tour guide explained that these soft and crunchy soybeans were popular snacks and great to take home as omiyage. We went to a vendor that sold two very different types of soybeans: one soft, the other crunchy. I never would have guessed that this treat was popular … it looked so ordinary! We got to sample the different soybeans before buying some to take home. I preferred the soft soybeans, but the crunchy version had great texture and flavor. Skewers are available from multiple vendors, but we chose one that seemed to have the most variety. 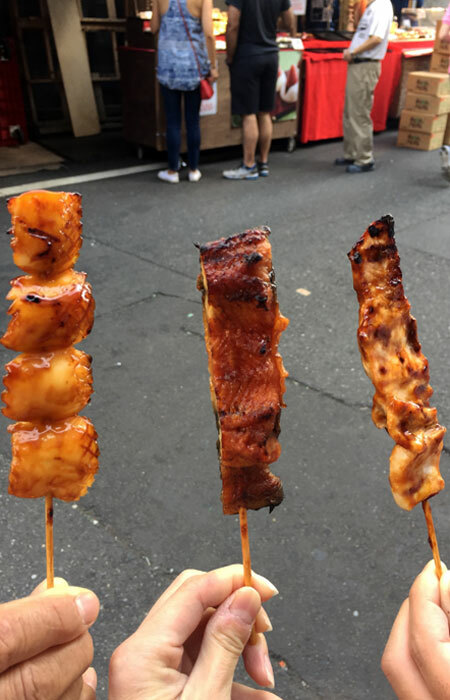 Each skewer cost ¥200, but the options were endless. We opted for scallop, unagi and swordfish. Some vendors didn’t allow photos, and this was one of them. Otherwise, I would have taken a picture of the sheer variety of skewer options they had. There’s just something about everything being made to order that’s just so appealing. Since each skewer was pretty cheap, it was a good way to sample more than one. I loved how thin and crispy the fresh unagi was. Confession: this wasn’t a stop on our foodie tour. 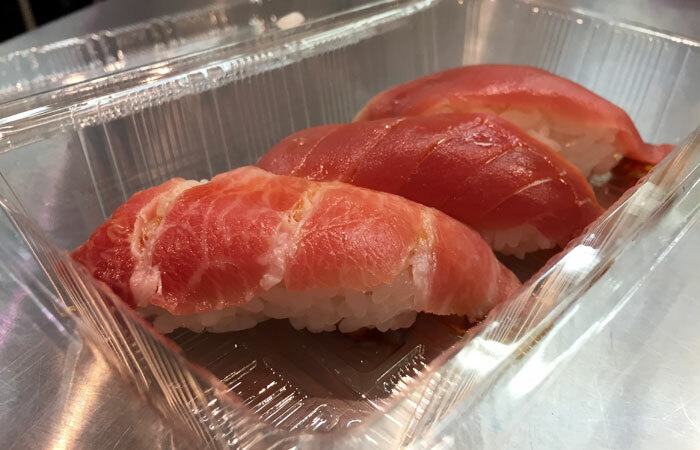 We got fresh tuna from Takatoyo Maru Murotoduring our first Tsukiji Market visit, and it was so good that we just had to make a detour. You can choose between lean, medium fatty or fatty tuna. Or go for a sampler — it’s the same price. For ¥700, you get three pieces of fresh tuna over rice. It’s made to order and you can see them cutting the fish behind the glass. I liked all three pieces, but of course, the fattier, the better. The tuna just glided off my tongue; it hardly needed any chewing. I can’t remember a time when I almost swallowed my fish whole. I probably could have ordered three more samplers. That’s how good this was. 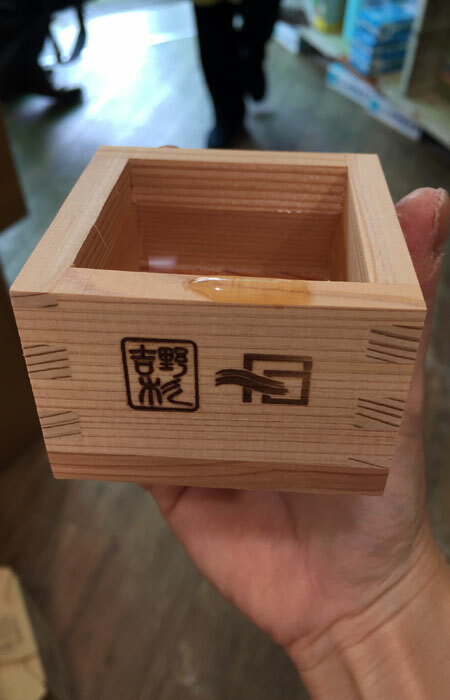 Our foodie tour ended with a sampling of sake served in square wooden containers called masu. Though it was hard to drink from the corner, our tour guide explained the fragrant wood helped to preserve the sake’s flavor.